It has been a long time since I have written in my blog, but it has been a busy, busy several months. The remodel began in September, and included the opening of a support wall, and total remodel of the kitchen and main bath. It seemed like a good idea at the time; the occupants would head off to Europe on the final leg of their honeymoon and I would oversee the contractors and sub-contractors for a couple of weeks. The day of demolition was a most remarkable day; the opening of the wall separating the kitchen and dining room made all the difference in the world to this small Spanish house. Day one ended with the removal of most of a wall, and the arch perfectly replicated—it was a glorious sight. My daughter and I had talked for years about the future lay-out of the kitchen, since it had such limited workspace. The first thing that had to move was the refrigerator. It was on the wall where a small ice box probably stood when the house was new. But the ice box would have been small and would not have taken up the same footprint of the more modern refrigerator, and felt as though it was standing in the middle of the room. It took several years to move into the area that was once the pantry around the corner. This change occurred when the master bedroom was expanded, master bath was created and the laundry/pantry room was expanded. With the refrigerator out of the way, the space was open for a pot wall and small work table, adding much needed counter space. See “Thank You Julia Child” June 14, 2014 and “A Great Estate Sale Find” June 29, 2014. A year later the floor was replaced, see “Another Family Project” January 26, 2015. 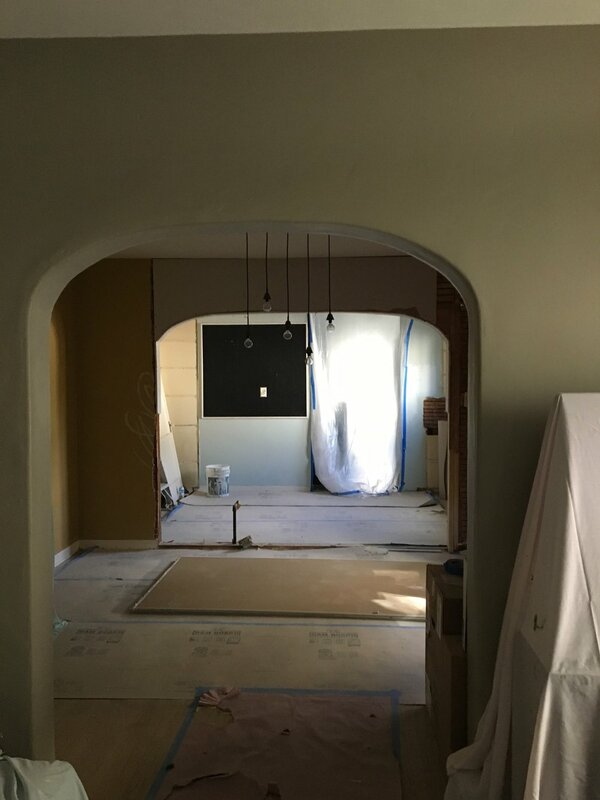 We were free to begin imagining the removal of the wall between the dining room and kitchen. Removing the load bearing wall proved to be economically not feasible. My daughter had worked long and hard on a floor plan including a new cabinet layout that, would mean the removal of the original built-in breakfront and cold storage cabinet. While these two features were great in their day, they offered little function in today’s kitchen. The doors on the built-in were heavy with eighty-six years of paint and offered little in the way of workable counter space. It was with some regret that they would have to go. The door from the kitchen to the hall needed to be closed off to allow for a bank of cabinets and the range to reside on that wall, formerly the breakfront/cold storage wall. Additionally, the “Julia Child Pot Wall”, could link to the wall of new cabinets forming an L shaped set of lower cabinets and countertops; already tripling the amount of counter/cabinet space. Originally the range was on the wall that separated the kitchen from the dining room, once it moved, the two rooms were united seamlessly with the arched wall as the only separation. Now family, friends and dogs can see and be a part of the conversation while the cook’s in the kitchen, without being in the way. What was gained in this remodel was: More counter and cabinet/storage space, a range hood, rather than a hole in the ceiling to serve as a “vent”, a dishwasher and garbage disposal, much needed ceiling lighting, a seemingly larger footprint, without actually enlarging the space and a far more functional kitchen work area. What was lost: Broken original hexagon countertop tile, original cabinetry consisting of a breakfront and cold storage area, most of a wall, and a door. The kitchen has modern features, with rustic undertones that suggest it was original. 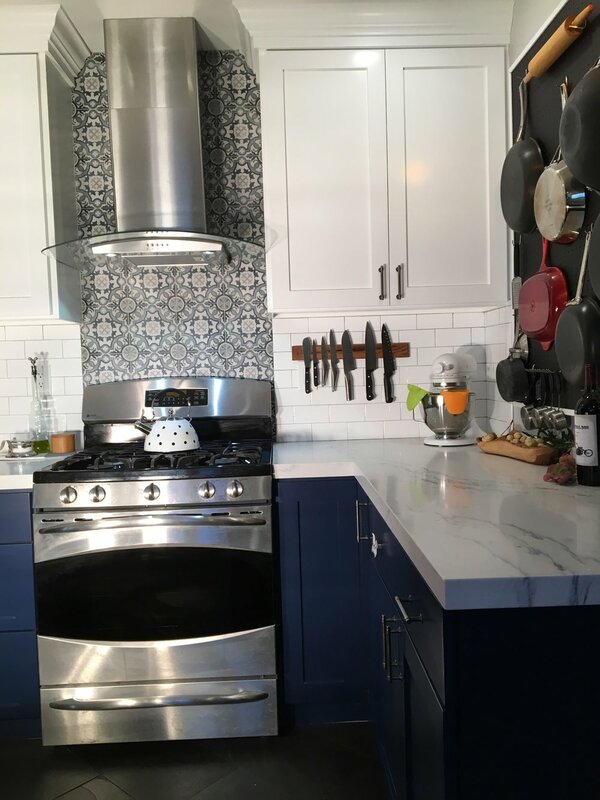 The tile behind the range was a spectacular addition of color and a nod to its Spanish origins. The slate floor continues to be the most serviceable flooring for dogs and people moving between the deck, patio and garden. The open shelving was added to bring a sense of history and warmth to the hard surfaces of the countertops and tile backsplash. The stained glass windows with their original wood frames meld perfectly with the wood shelves adding to the authenticity of the remodel, while offering privacy from the neighbors and allowing maximum light to flow into the space. While the process was tedious, every design and lay-out decision was exactly as imagined, and my daughter and son-in-law are thrilled with their “new” kitchen, as are the dogs who can be a part of the family without being much in the way.